Have you ever mail-ordered something, and had to wait for it so long that when it actually came, it kinda seemed like you never paid for it? Much to my annoyance, this was the case when I ordered my Neon Genesis Evangelion: Collection 0:1 DVD. I ordered it in late December last year, and it only arrived today, a full six months later. But, as with most things, the longer you have to wait, the sweeter it'll be when the waiting is over. And boy, oh boy, is it ever sweet. 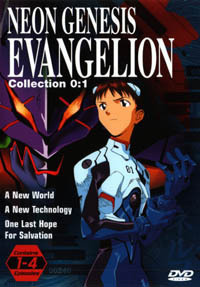 For a very ecomomical price, the DVD contains episodes 1 to 4 of Evangelion, in four (FOUR!!) dub languages: English, French, Spanish and the typical Japanese. ADV definitely has their fans covered with this one. Being fluent in French, I had the opportunity to evaluate how Eva was done en français. The dub is surprisingly good. Although, for the most part, I could not understand the Spanish dub, everything sounds quite decent. Even if you can't speak a word other than English, it's definitely a cool novelty to hear Misato complaining about her car and her dress in 4 different languages. With most TV series on DVD, the video quality can be a real disappointment. The video was never really intended to be distributed digitally, so the quality can never be guaranteed best. This time around, the quality is standard ADV fare -- which is very adequate. Every measure is taken to deliver the best picture quality possible. As an added bonus, ADV has re-done all the visual translation. Kanji on things like the train schedule and Shinji's photo of Misato are carefully airbrushed out and translated to look as "natural" as possible. Very nice touch. They also use a different font for the opening credits, which resembles a narrower Times-type font with a serif and a softer drop shadow effect. Looks much classier this way. I like. The DVD's special features are also what's to be expected of an ADV DVD production: Scene selection, character bios, featured ADV previews you can watch at your leisure, and "web connect," which is basically just a link to their web site on the 'net. One thing I really enjoy are the interactive menu screens, which are very appropriately made to look like one of the myriad control panels in the NERV dogma used to monitor an EVA unit's stats. That's right, folks... Operating the DVD's menus can actually help improve the sync ratios between you and your EVA. DAME DESU!! One thing I really enjoyed about the DVD is the fact that, unlike most bilingual anime DVDs, the default audio language (the audio language the DVD first uses without any user intervention) is the original Japanese. This is just a nice touch. Kudos to ADV. I've quickly become a fan of anime on DVD because of the economical price (you pay the typical price of a sub copy on VHS and have a superior DVD copy that's both a dub AND a sub with or without subtitles! ), the excellent audio and video quality, the cool features... and the undeniable coolness DVDs have over those rotten old videotapes. It's an unspoken law that stuff is cooler on a shiny disc. I dare anyone to prove me wrong. In closing, Neon Genesis Evangelion: Collection 0:1 is a great way to first experience Evangelion, while at the same time being a sweet little package deal no true Eva nut should be without. Your only excuse is not owning a DVD player. Enjoy! Do you like Eva? Don't be a fool! Get this DVD! !